The recent UK floods caught many households by surprise. There’s little you can do to prevent the devastating waters but preparing your family and your home will help to keep damage to a minimum. This is our guide to preparing for flood. If you’re under serious threat, read more about preventative measures at the Environment Agency or your local authority website. Choose stone flooring for the ground floor, instead of carpets, tiles and wood, which can come loose and suffer worse damage. You can lay soft rugs on top, which can then be taken upstairs if you receive flood warning. Make sure your downstairs furniture can be taken upstairs – don’t choose anything too bulky or heavy. Store items that are precious or important in an upstairs room or safe. Order some sandbags and a supply of sand to keep near the back door. To use them, ask someone to hold open each bag while you fill it halfway up with sand. Fold under the top (head) of the bag and place each one so it’s ‘head on’ to the water flow. Layer the sandbags below windows and doors, pressing firmly on each one to get rid of any air gaps. If building a large stack, create a pyramid, and cover with plastic sheeting. Check your door and window seals. It’s also possible to buy waterproof exterior paint for your house. As an emergency measure against water, you can apply silicone sealant, but make sure you open them and wipe off before it dries. When replacing your kitchen, choose hardwearing plastic, solid wood or freestanding units and surfaces. Look around for liquids that could leak into the water in a flood. Things like tins of paint, bleach and toilet cleaners should all be kept on a high shelf to avoid them leaking into the water. Check the garage and shed, too. 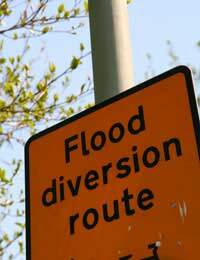 You can buy or make Flood Boards to cover doors and windows. This involves fixing a permanent frame around each opening; when a flood occurs, you slide in the Flood Board to provide better protection against oncoming water. For these (and property wrapping tips) see the Environment Agency’s website. If you live in an area that is prone to flooding, it is wise to assemble a Flood Kit. Don’t think of it as tempting fate – think of it as a potential lifesaver. With a Flood Kit readily to hand, you and your family can get out of the house much quicker and find your way to a safe place in good time. A laminated sheet of useful phone numbers, such as the environment agency, your council, friends and family. On the back of this sheet, note where the taps for electricity, gas and water are, so that you can turn them off. A change of clothing for everyone plus wellies, waterproofs and blankets (you may have to gather these as you leave). A torch, mobile phone, rubber gloves, and a radio if you have one. If you get a flood warning – or the flood waters arrive without notice – these are the first things you should be doing. Delegate some of them to a partner or grown-up son or daughter. Do a quick scan for electric appliances, and take them upstairs. Take personal, financial and identifiable documents upstairs, along with any sentimental or valuable items in your possession. Use sandbags to reduce the amount of water getting in. Plug the bath and sink and weigh down the plug with sandbags. When these four are done, start looping curtains over the top of the rails, moving furniture, rolling up carpets, removing doors from their hinges, and putting bricks beneath large sofas to stop the water reaching too high.